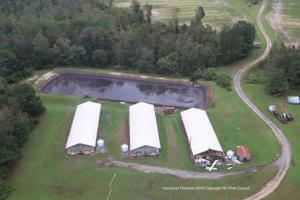 Environmental Impact of Florence on the NC Hog Industry. Lessons learned from the 1999 Hurricane Floyd were applied in the days leading up to the landfall of Hurricane Florence. According to a statement issued by the North Carolina Pork Council losses amounted to 5,500 hogs out of a population of 8.9 million on 2,100 farms in the State. This compares to 21,000 hogs drowned or destroyed in the 1999 event. •One lagoon breach occurred on a small farm in Duplin County. An on-site inspection showed that solids remained in the lagoon. The roof of an empty barn on the farm was also damaged. •Nine lagoons have been inundated by flood waters. •Thirteen lagoons are at capacity due to rainfall and appear to have overtopped. Others are at capacity and efforts are being taken to respond within state regulations and guidance. Critics of the North Carolina hog industry, including Dr. Mark Sobsey of the Environmental Science Department at the University of North Carolina, Chapel Hill, expressed skepticism in the low numbers of lagoons impacted. In a statement on Monday 16th September he noted that in the severely affected counties, elevation is “barely above sea level.” Sobsey commented “I’d like to see some evidence to show that somehow swine farms and lagoons have been spared as everything else fell under water.” He is welcome to transition from his ivory tower and journey eastward to observe conditions firsthand. Maybe even help with cleanup.